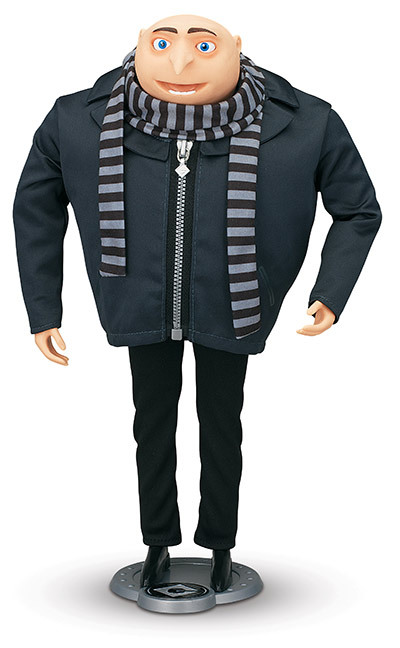 "The first installment of Despicable Me was a blockbuster hit and fans worldwide immediately fell in love with Gru, Agnes, Margo, Edith and of course, the Minions," said Lisa Harnisch, Senior Vice President, General Merchandising Manager, Toys"R"Us, U.S. "We worked closely with our valued partners to be the first retailer to offer Despicable Me 2 merchandise, including fun exclusive items sold only in our stores, providing customers the opportunity to experience all the excitement of the movie before it hits theaters." In Toys"R"Us stores now, shoppers will find exclusive items from Thinkway Toys such as a banana-scented Fart Blaster, plush characters and interactive Minions that are sure to bring a smile to even the most evil villain. Also currently available are collectible action figures, a build-your-own Minion figure, a Minion missile launcher, a Minion mobile and much more based on the movie's lovable (and despicable!) characters. And, beginning May 30, fans will find all of these products along with classic games like Despicable Me 2 MONOPOLY and Despicable Me 2 OPERATION in a dedicated feature shop inside Toys"R"Us stores nationwide. "We are thrilled that Toys"R"Us has quickly brought Despicable Me 2 products to shelves, making its stores the ultimate Despicable Me 2 destination," said Jamie Stevens, Senior Vice President of Global Retail Development, Universal Partnerships & Licensing. "The company's excitement for this film is yet another great example of Toys"R"Us knowing exactly what its customers want and its commitment to providing them with the most expansive and unique assortment of merchandise available. We value this partnership and are excited to be working with Toys"R"Us to bring Despicable Me 2 toys to the film's fans." The ultimate gadget for Gru's unpredictable Minions features sound effects, color changing lights and a banana scent. 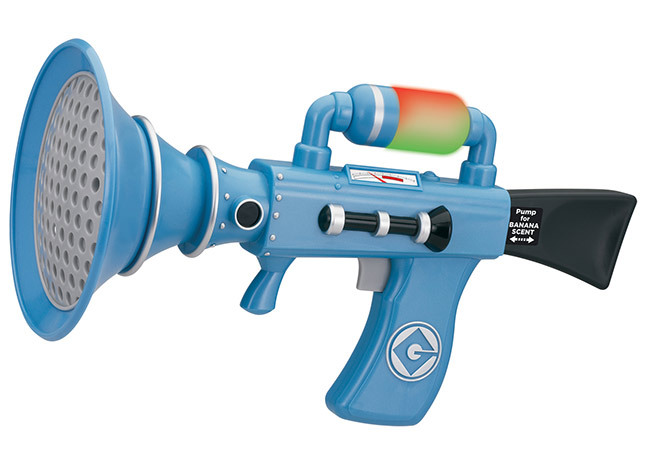 Kids can pump the blaster to activate banana scent, and pull the trigger for farting sound effects. Pranksters can activate the "Joke Mode" which delays sound effects by 20 seconds after pulling the trigger. 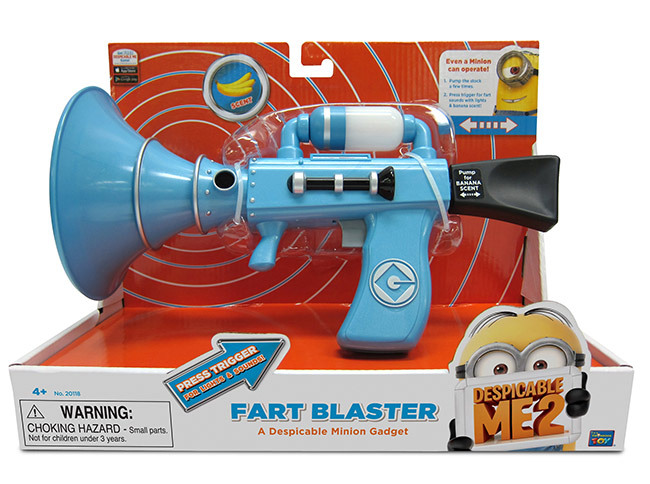 The Banana Fart Blaster is now available exclusively at Toys"R"Us stores nationwide. Ages 4 to 12 years. Batteries are included. 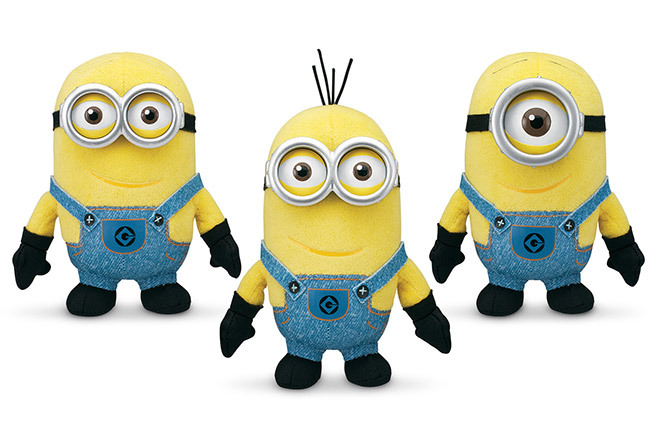 Cuddle up with your favorite Minions! Stuart, Dave and Tim are soft and just waiting to be hugged! The Plush Buddies 3-Piece Set is now available exclusively at Toys"R"Us stores nationwide. Ages 4 to 12 years. Batteries are not required. Kids can take home their favorite characters from the movie! Each set comes with 10 highly detailed collectible figures and display stands. The 10-piece figure set is now available exclusively at Toys"R"Us stores nationwide. Ages 4 to 12 years. Batteries are not required. 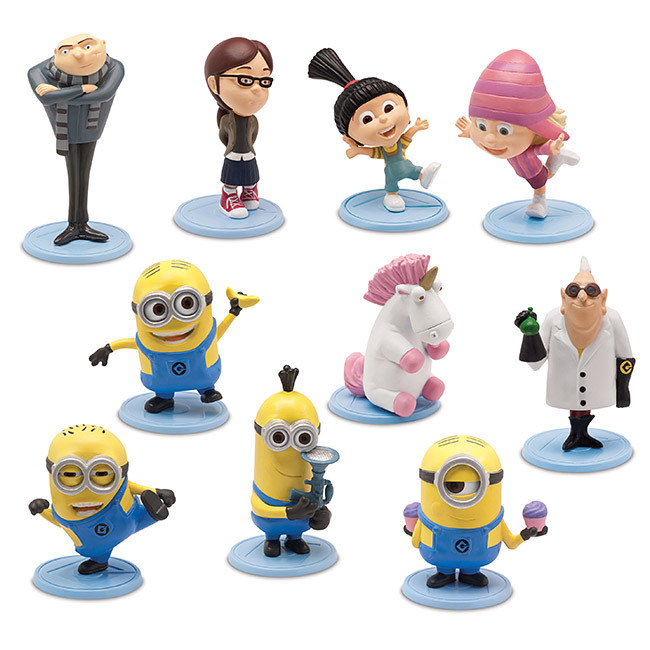 Gru, Minion Dave and Agnes are highly detailed deluxe interactive figures with moving heads, eyes and mouths. Each character can say at least 30 phrases from the movie in their original voices. 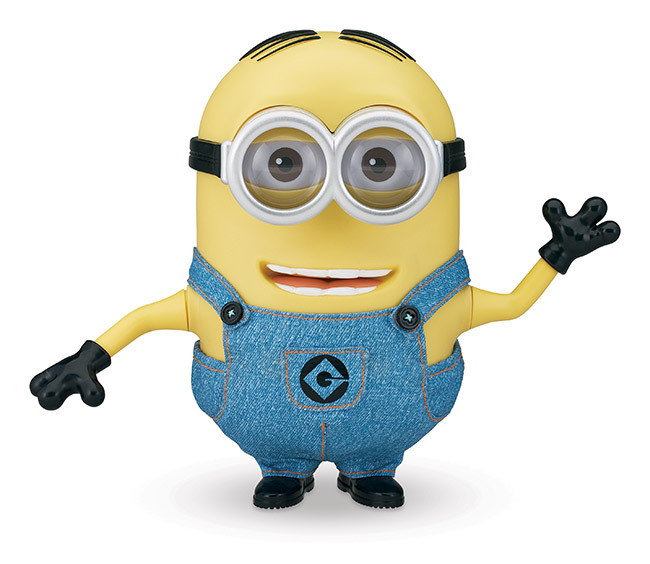 When you talk to them, they respond; Minion Dave and Agnes will even sing you a song! Collector's Edition Minion Dave, Gru and Agnes are sold separately and will be available exclusively at Toys"R"Us stores nationwide in September. Ages 4 to 12 years. Batteries are included. UP&L oversees Universal's consumer product licensing, film and home entertainment promotions, and all corporate alliances for Universal's theatrical, home entertainment, theme parks and stage productions. This dedicated division is also responsible for monetizing the Studio's vast library of films and characters through licensing, branding and marketing opportunities. UP&L is part of NBCUniversal. NBCUniversal is one of the world's leading media and entertainment companies in the development, production and marketing of entertainment, news and information to a global audience. NBCUniversal owns and operates a valuable portfolio of news and entertainment networks, a premier motion picture company, significant television production operations, a leading television stations group and world–renowned theme parks. NBCUniversal is owned by Comcast Corporation. Thinkway is a leading Global Toy Company founded and owned by Albert Chan, President and CEO. Thinkway is known for its high quality details, along with the ability to bring toys to life with electronics.